The California Poppy, Eschscholzia californica is worthy of its role as the California State flower. Eschscholzia californica grows so well in so much of the state. And the blooming period is so long that flowers can be found for most of the Spring and even into the Summer if there is a little irrigation. I usually plant Eschscholzia californica seeds in the middle of the Fall with the first rains. 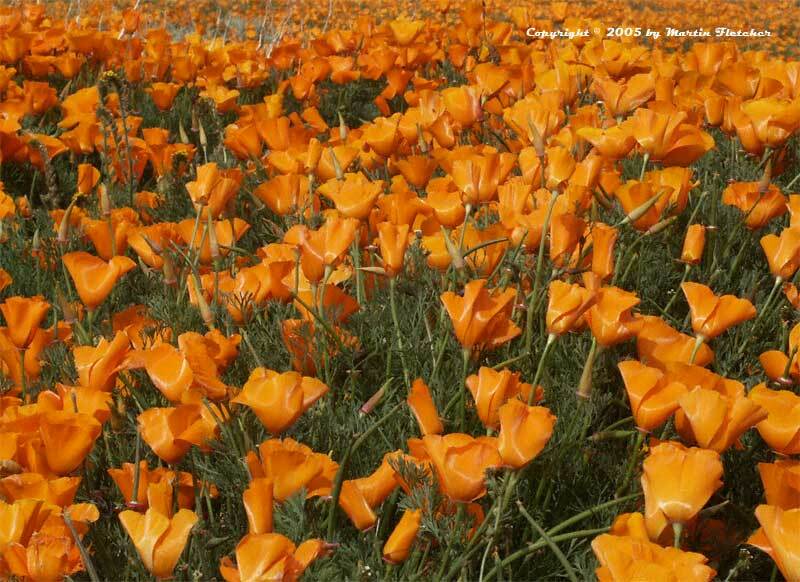 Care should be taken in planting California Poppies where they already grow. The seeded varieties will interbreed with the local natives and can in time shrink or even eliminate the native gene pool. Most of the seed that is sold is Eschscholzia californica ssp marina. This is a larger flowered poppy that is adapted to near coastal conditions. I take the utmost care in choosing plants when planting adjacent to wild areas. A field of orange flowers - Eschscholzia californica - California Poppy. High resolution photos are part of our garden image collection.